As many of you know, I have been blogging since late January of 2012. At the time, I was writing of Street Vogue. Out of that unique internship, I developed Magnify Your Style. Over these last few months, Magnify Your Style has become a source for honest information, unique perspective, and a treasure chest of information for those who seek it. I have big plans for Magnify Your Style. Part of those is getting in touch with NEPA. Though I am a Jersey girl at heart, I have lived in NEPA for the last seven years of my life. I graduated highschool from Pocono Mountain West High School and graduated with a B. A. in Professional Writing from King’s College, Wilkes-Barre. My objectuve is to tap into NEPA local sources to make Magnify Your Style a fashion source for NEPA. People within the United States and across the globe come to Magnify Your Style seeking fashion forward information. National and International coverage is fantastic, however, becoming a local source for people who live near me, would be AMAZING! Since launching Magnify Your Style, I have noticed many stores I plan to bring to light on this blog. Though I have mentioned a few through social media, I know that the NEPA BlogCon will connect me to local businesses that can utilize my services. By connecting with local businesses, Magnify Your Style can become a local internet source and businesses will benefit from exposure on the World Wide Web. I am social media savvy. My blog can provided engaging, entertaining content as well as sharing post on social media. Since the 00s, Social media has become a part of everyday life. In fact, some of these sites are used as search engines to find information. Unlike Google, Ask, and Yahoo, these sources have been seen by other users. These users are trying to share and help others looking for this information. As a result, all social media accounts will be used to promote content obtained from coverage of this years NEPA BlogCon. By doing this, people will have further knowledge of resources available to them. For example, I have lived in Luzerne County for about four years. During that time, I did not visit many local stores. After I graduated King’s College, I wanted to change that. As a result, I have used my social media accounts to promote the Hoyt Library (Kingston, PA), Tuesday Morning’s (Edwardsville, Pa), The Park Avenue Boutique (Edwardsville, PA), and Bratty Natty’s Boutique (Wyoming Valley Mall). While attending the NEPA BlogCon, I will cover information presented by the speakers, conduct interviews with businesses within my field that will be featured on Magnify Your Style, provide an overview of the days events, and encourage areas around the nation to host similar events. Promoting others within your field/location will help you and your associates. As many know, developing a website doesn’t mean people will see it. Overall, I hope my reasons for requesting a Press Pass to 2012s NEPA BlogCon is persuasive and compelling. If not selected, I appreciate you taking out the time to read the post. Good luck to those who are trying to win a pass and congratulations to the winner. 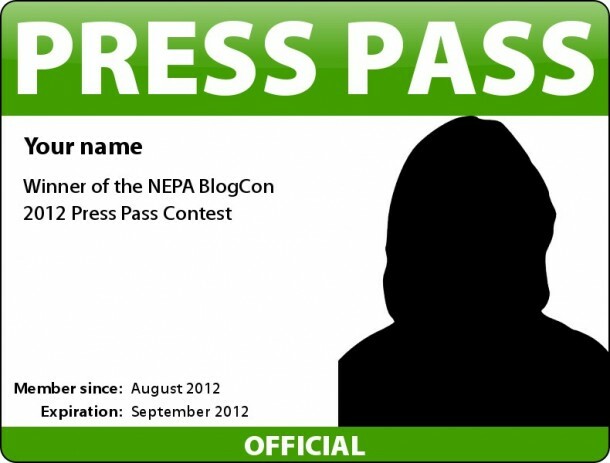 If you would like to help me obtain a press pass, please leave a comment on Win an Official NEPA BlogCon Press Pass stating why Trisha Streeter of Magnify Your Style should receive a press pass to the 2012 NEPA BlogCon! In advance, thank you for your love and support of Magnify Your Style! OHHH EMM GEEE!!! So I was going to post a comment for you and I see you already won! Congrats times a million I’m sure you’ll do that press pass justice. Congratulations Patricia on winning the NEPA BlogCon Press Pass Contest!